When nineteen-year-old Stella marries Theron Renier, she has no idea what kind of clan she's joined. Soon after their arrival at Illyria, the Reniers' rambling beachside home, Theron is sent on a diplomatic mission, leaving Stella alone with his family. As she tries to settle into her new life, Stella quickly discovers that the Reniers are not what they seem. Trapped in a world unlike anything she's ever known, vulnerable Stella attempts to uncover her new family's dangerous secrets-and stirs up a darkness that was meant to stay buried. 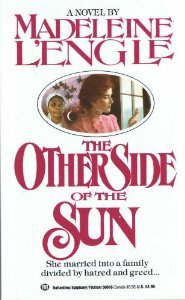 From the beloved, National Book Award-winning author of A Wrinkle in Time, The Other Side of the Sun showcases Madeleine L'Engle's talent for involving and suspenseful storytelling.